Are you seeing double? Is something the matter with this web page? 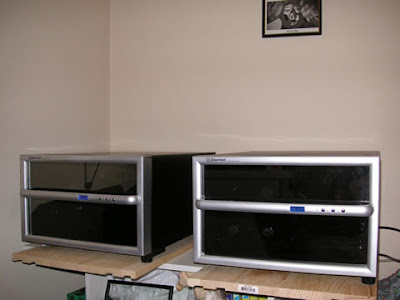 Nope, that's the 2nd Emerson wine cooling unit, set up side-by-side with the first (with the recommended 5" clearance all around). When I first plugged it in, around 6:00, the digital temperature readout showed 83 degrees. Yes, it's hot here!! The original running unit showed 57 degrees, so thankfully it's been working well. It took about 4 hours for the new one to get down to 57. That's a pretty long time but as long as it stays constant, I'm happy. Please excuse the makeshift surroundings in the picture. Yes, those are two unfinished pine boards underneath, one still showing the Home Depot price tag because I didn't think to face it the other way. The rubber feet on the coolers are too far apart to fit on that shelf without some other kind of support, hence the boards. And if you have good eyes, you'll discern the Lion King higher up on the wall with those two buddies of his whose names I forgot. So what next - the start of an empire of coolers? 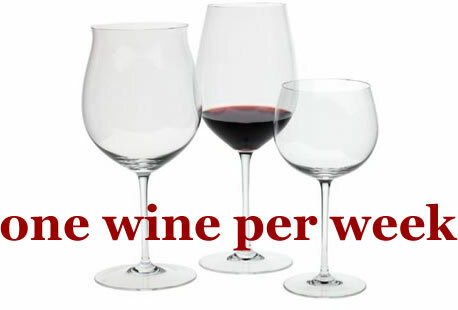 Nope, this really is good enough for a one-wine-per-week guy. The good thing is the new cooler is empty (just some ringers sitting in there for now) so it's just waiting to be filled with new discoveries. I'm waiting for cooler weather to get those goodies from WineQ and Cameron Hughes I mentioned in the previous post. Last note: congratulations to Dr. Debs, author of the Good Wine Under $20 blog for being named as one of the five best wine blogs in the Fall 2007 issue of Wine and Spirits. It's a much-deserved award. I'm sure if you found your way to my own obscure blog you know of her already, but if not, by all means check out her blog. It's well worth it.